Yes, Anne, the host AKA “Bad Tempered Gardener,” shared that there were gardens of weeds throughout her garden. Still beautiful…but I did have a massive allergy attack after wandering around. It was still worth the visit! The residence had a unique look compared to our other experiences. This was part of the garden in front of the house. How could I resist this rooster? 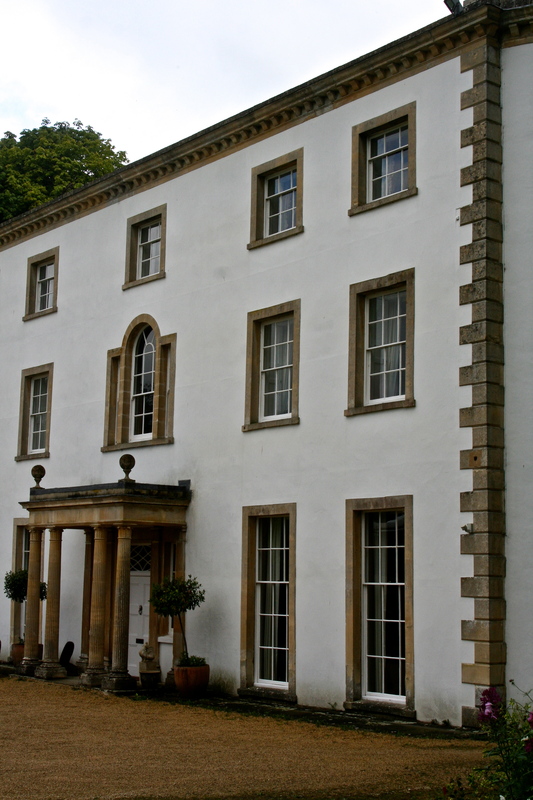 Overbury House was rebuilt after a fire in 1738. 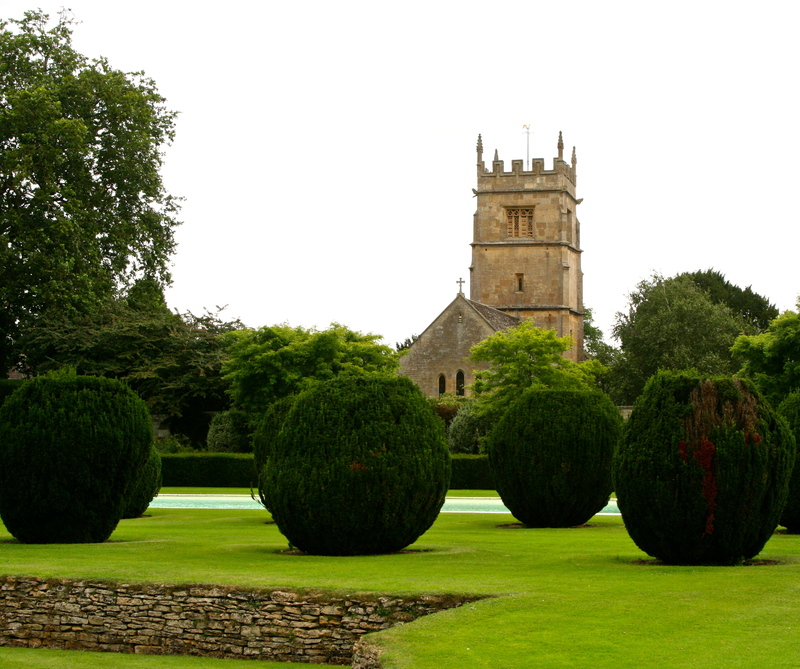 Constructed of the golden, ashlar faced stone famous in the Cotswold, it is privately owned. 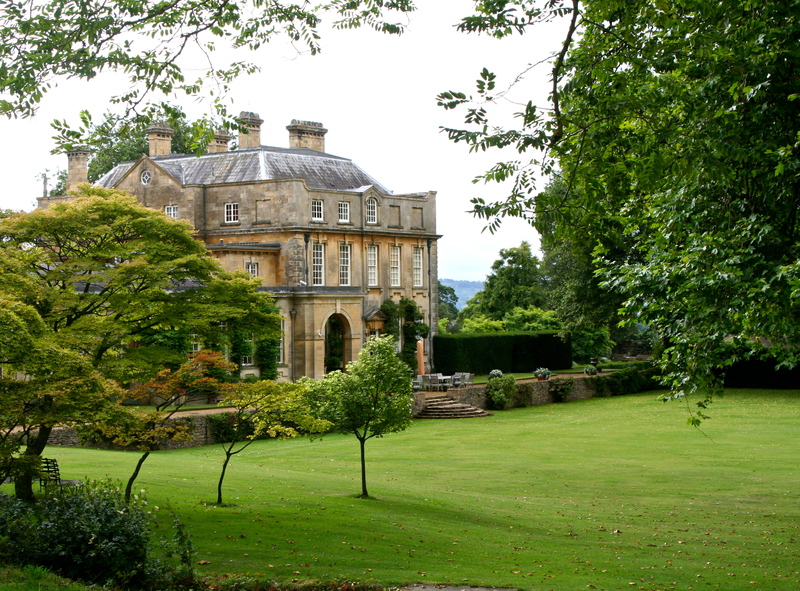 The head gardener treated us to the tour of the three acre garden and the lush parkland surrounding the house. The owners were present so we were kept discretely away from the main house. The 3000 acres included 2 villages— yes, they own the villages also. This estate is surrounding by 3 rivers and is subject to flooding according to the gardener, perhaps the reason for the lush parkland and simplicity of design! The head gardener shared that staff would often enjoy a swim here when work was completed. I like that thought! This gives you a sense of the manicured grounds with a view of the estate chapel. Whitcombe House is literally next door to the Overbury House. It voluntarily participates in the National Garden Scheme, where revenues raised through entrance fees are donated to various charities. We were excited about its lovely one acre garden. We had finally found something we might hope to replicate. We were treated to homemade cakes and tea by the family, while grandchildren ran free with the dog . 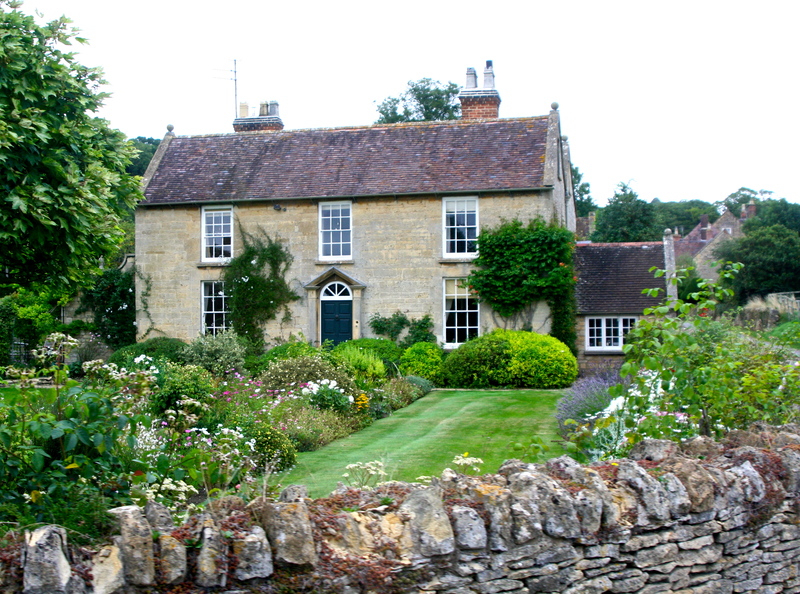 The personal touch was a delightful change from our previous experiences of estates…. manors….. courts….etc. Our first view of Whitcombe House from the bus. I love stone walls. I wanted to take this one home! 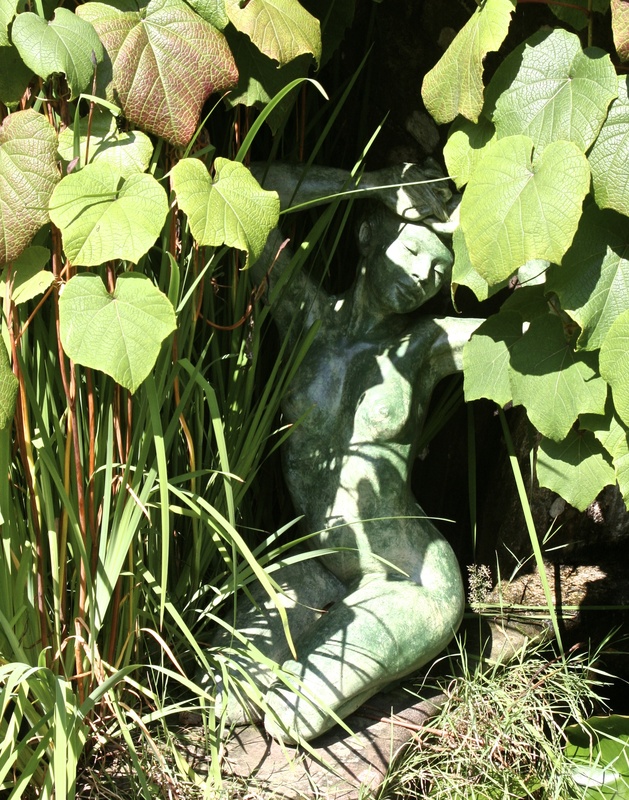 Part of the backyard garden, full of delightful surprises, all in one acre. 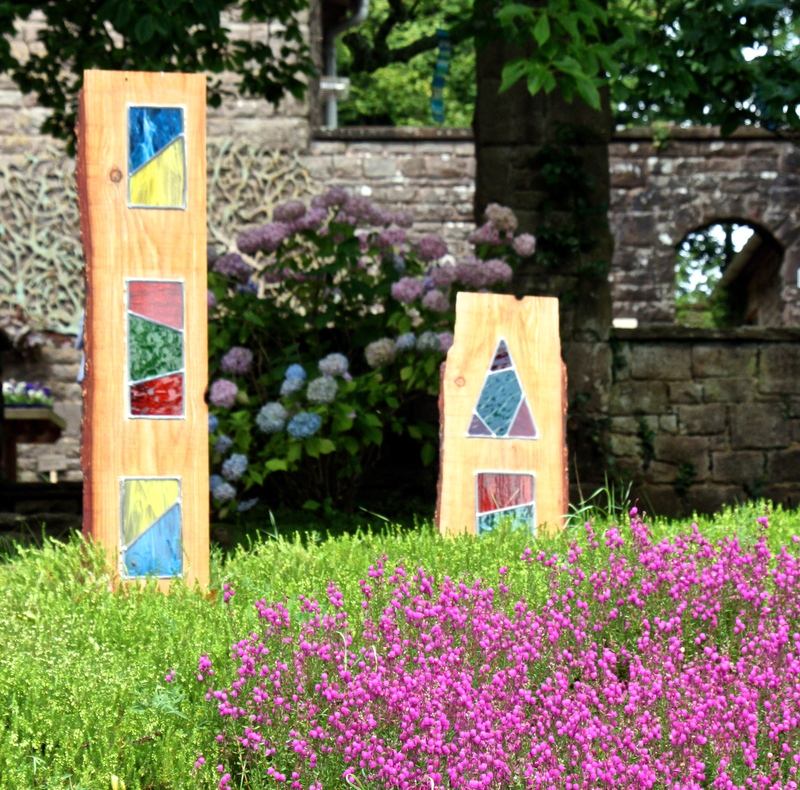 Wyndcliffe Court Sculpture Gardens was not on our original agenda. It turned out to be one of my favorites. 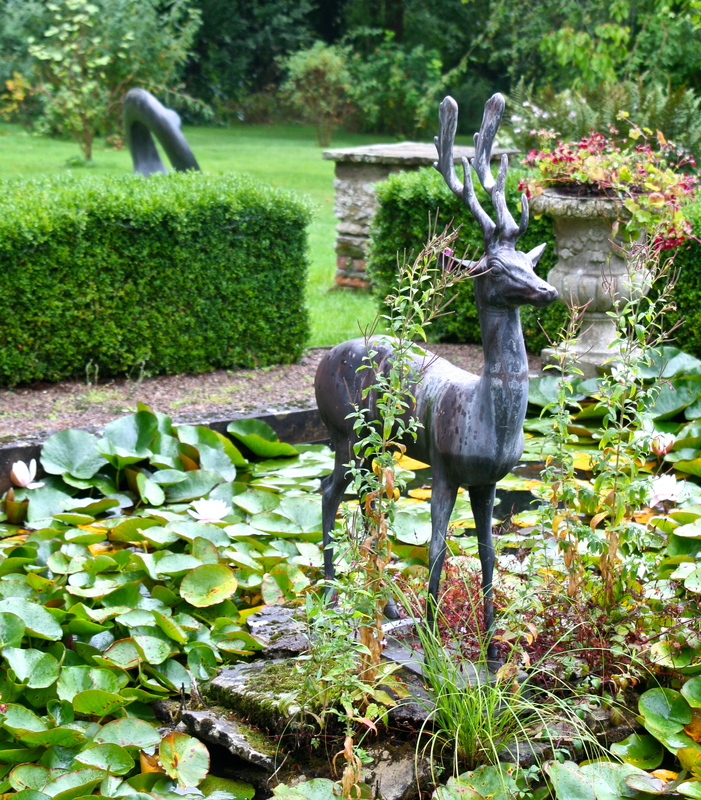 Described in the “arts and crafts” style, this estate hosted two sculpture shows during the year featuring hundreds of sculptures throughout the gardens. (There are never enough; I was one happy visitor!) The original gardens were completed in 1933. Eventually, the owner left his fortune to his gardener. 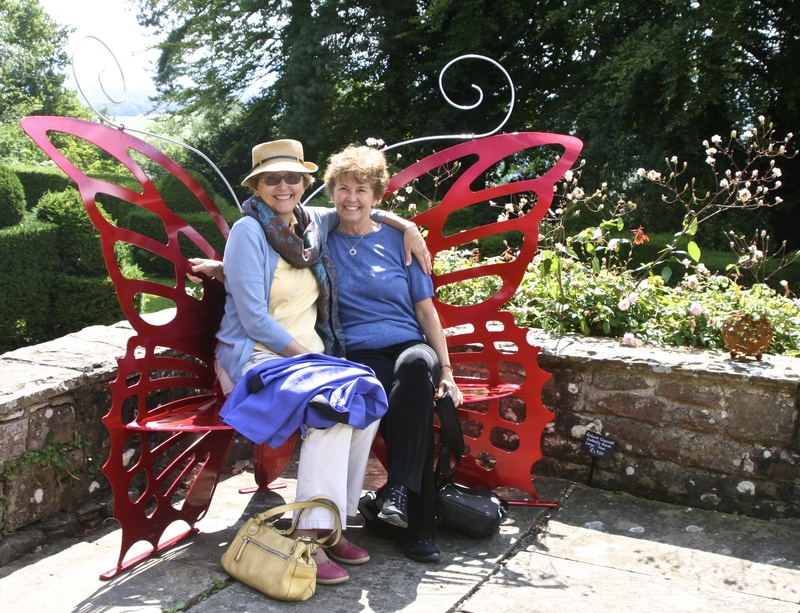 Together they had created sculpted yew hedging, topiary birds and animals, and long grass bowling greens, a perfect venue for the present day sculpture displays. This bench awaited us as we entered the grounds. Jane and I could not resist. I wanted to bring it home! Like this nymph one had to look closely to spot many a hidden delight. 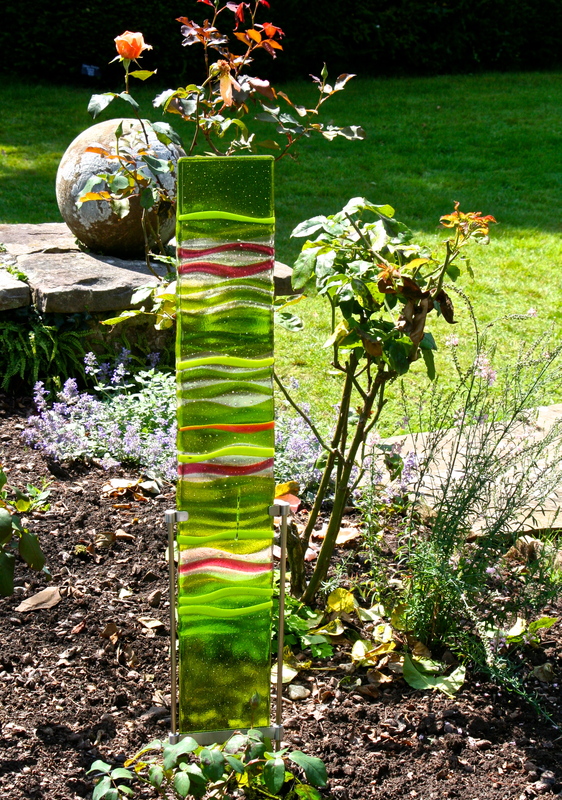 From large metal dragonflies in the forest to these glass sculptures, the variety was amazing. 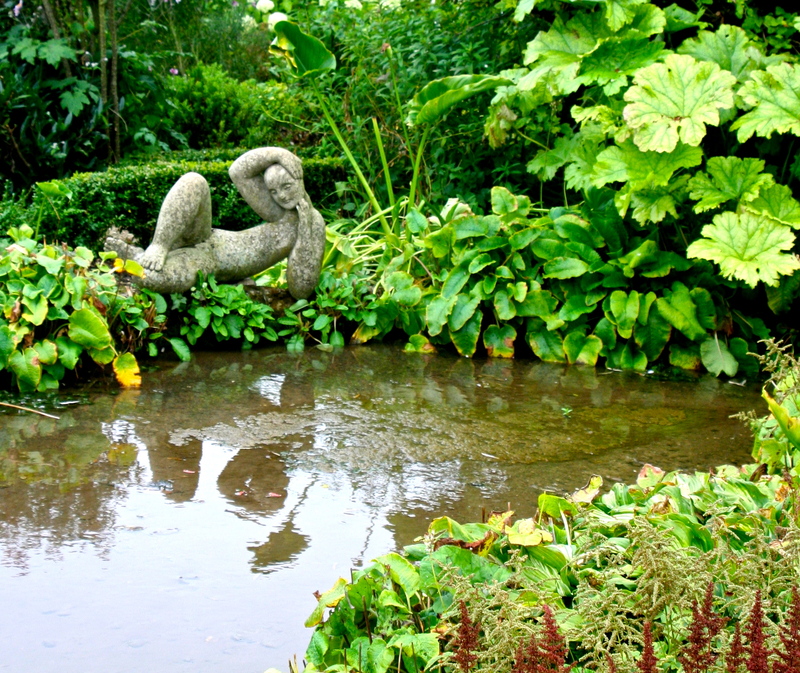 Veddw House Garden, in Wales, was truly unique in that it was designed and cared for by “The Bad Tempered Gardener” and her husband. Anne, our hostess, shared with us that she loved gardens but hated gardening! 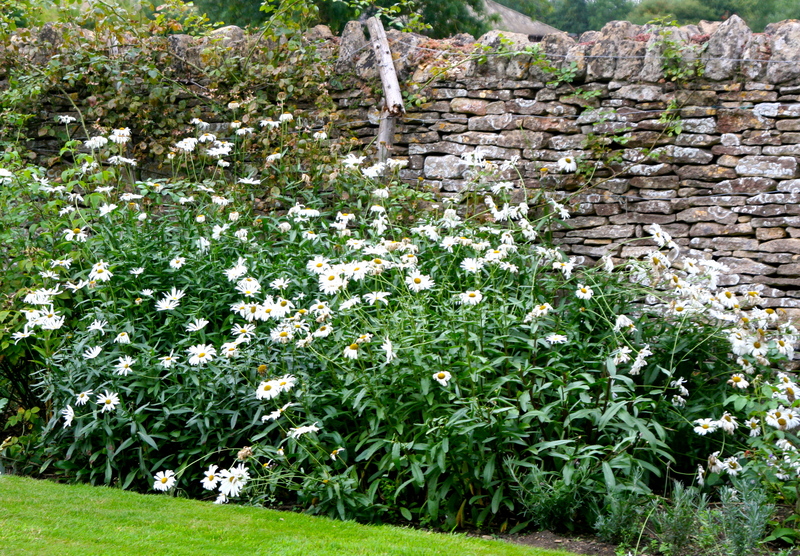 Despite her challenge, they have created what is described as “a modern romantic garden.” Using two acres for gardens and two acres as woodland, the quirky garden was dominated by incredible hedges and LOTS of wild flowers including flowering weeds— yup, I had a massive allergy attack and used up half of England’s supply of Kleenex. Each view brought a smile, such creativity. This was a favorite. What you do not see is the reflection pool, also mesmerizing. 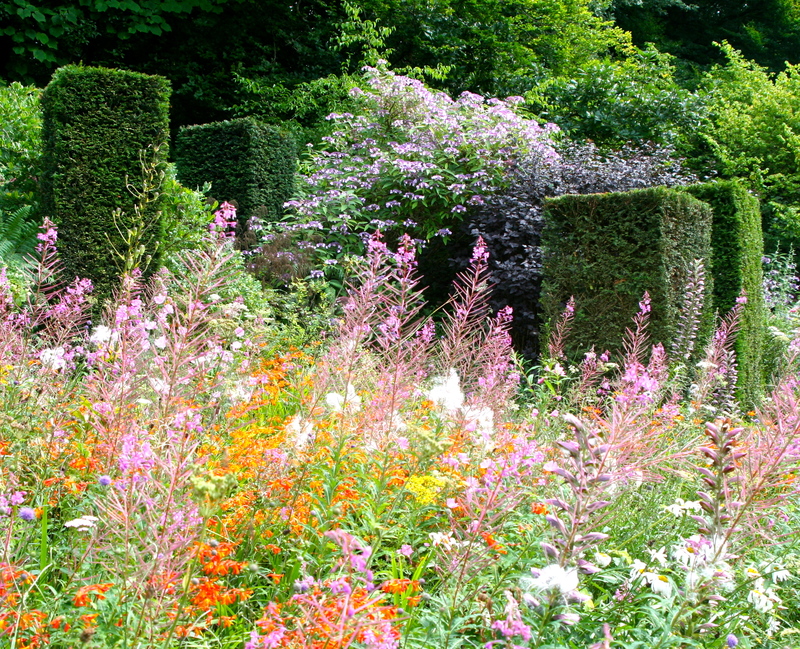 Hellens Manor was our last garden to be visited. 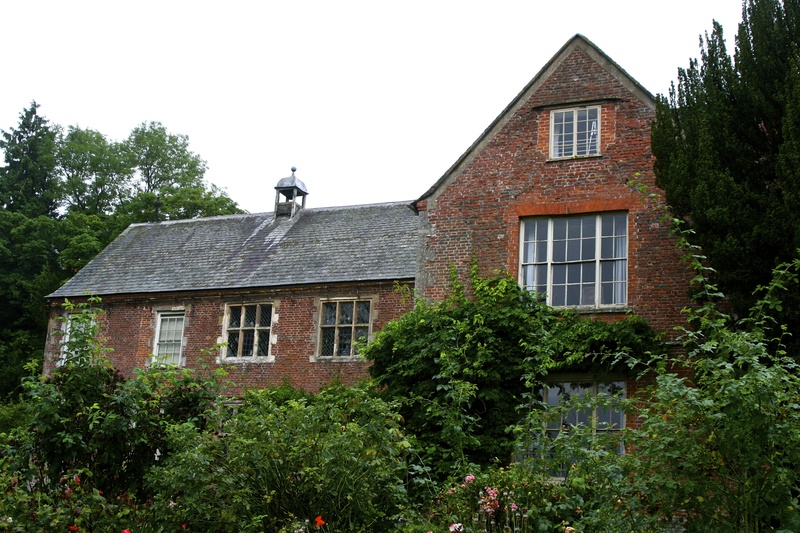 More than a garden, Hellens was a historical monument to centuries of history including stories of Ann Boleyn, Mary Tudor, the Earl of Essex, ghosts, and more. The manor was granted to the Bolem Family in 1096, one of whom witnessed the signing of the Magna Carta. Our focus was on the house this time. We had a delightful tour guide who had many stories to tell, including one about surprising guests in a bedroom while leading a tour. 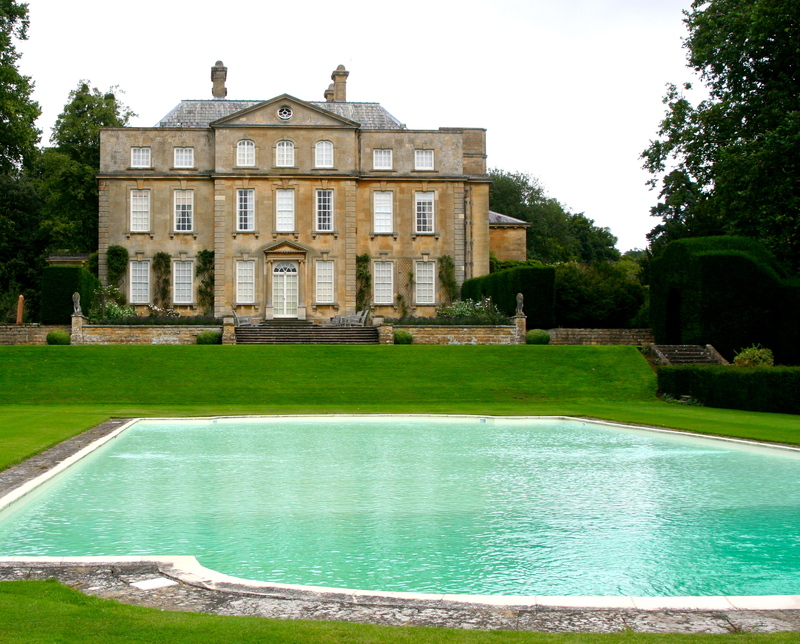 The owners created a charitable trust, which runs the estate today. The curator is both American and English, not so unusual apparently based on our experience. 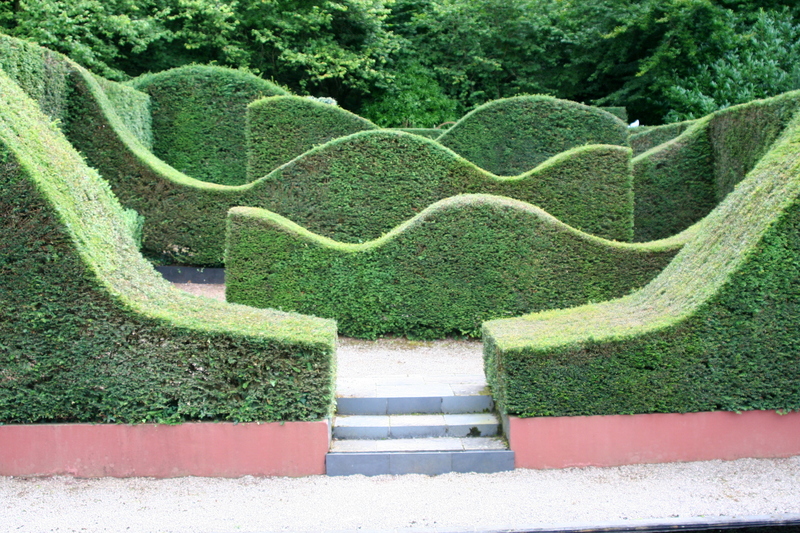 The gardens are a work in progress, but did include animal sculptures, a yew labyrinth (easy solved! 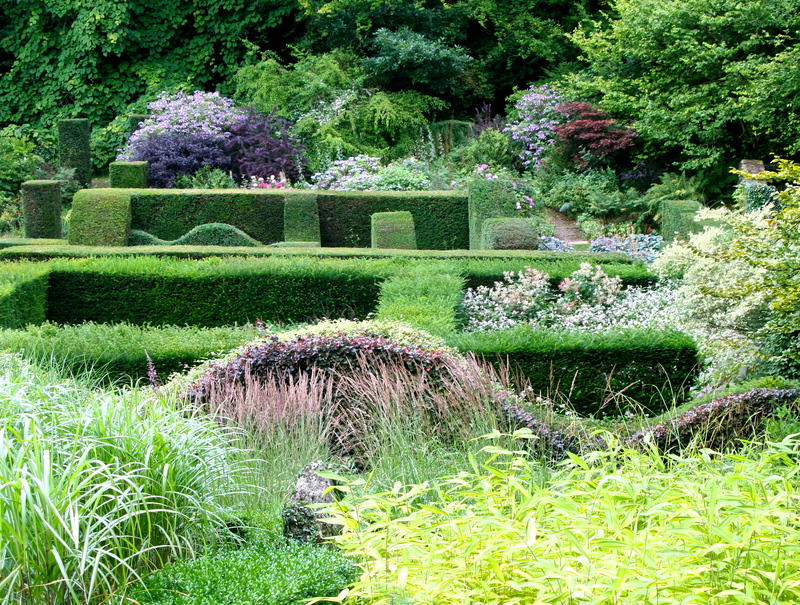 ), and a walled knot garden. 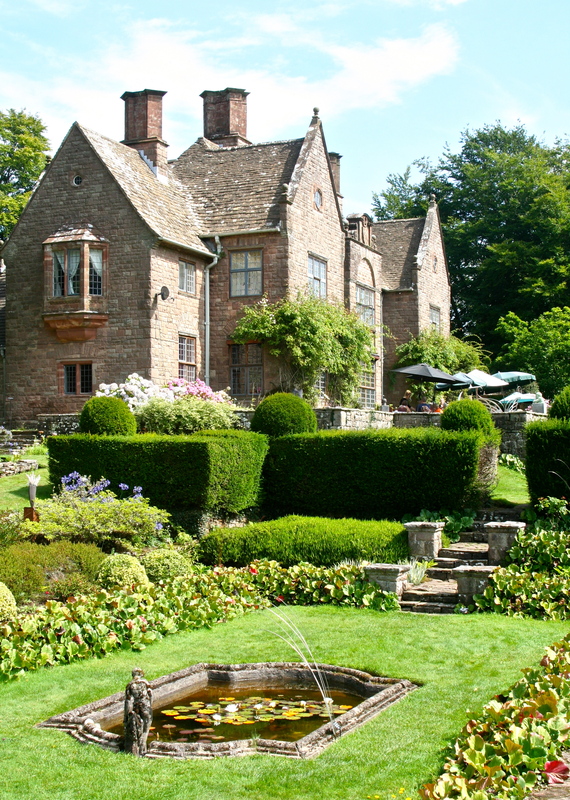 Hellens Manor in the town of Much Marcle. 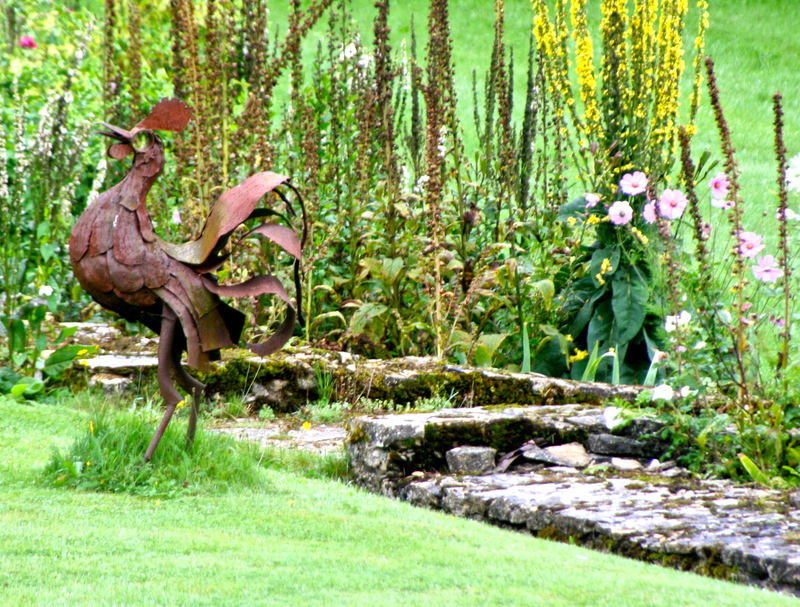 A favorite part of the garden near Hellens Manor. As you can imagine, there was so much more to see and describe with the gardens. This was just a taste of our experience, which was absolutely delightful and magical.